I asked staff about what represents and means rumor Status and Strength. Because to me they mean next to nothing, and I play the Poet Laudate since a year ago! I just get a vague reference of the rumor's worth with these two variables, to gauge if it's worth my time to quash it or influence it till it disappears. Staff told me to post this query here. Could staff illuminate us on this matter, please? And perhaps add it to some helpfile. I actually asked this question in a separate thread some time ago and received no response. Would love to know the answer, myself. Finally, I would love for someone to explain to me what the differences are between rumor STATUS and STRENGTH. Quashing affects one, influence affects the other. So which one is used in calculations that determine how long the rumor is around? Both? What about status? Is that for determining how much a rumor costs? Would love for this to be demystified a bit for us regular joes. 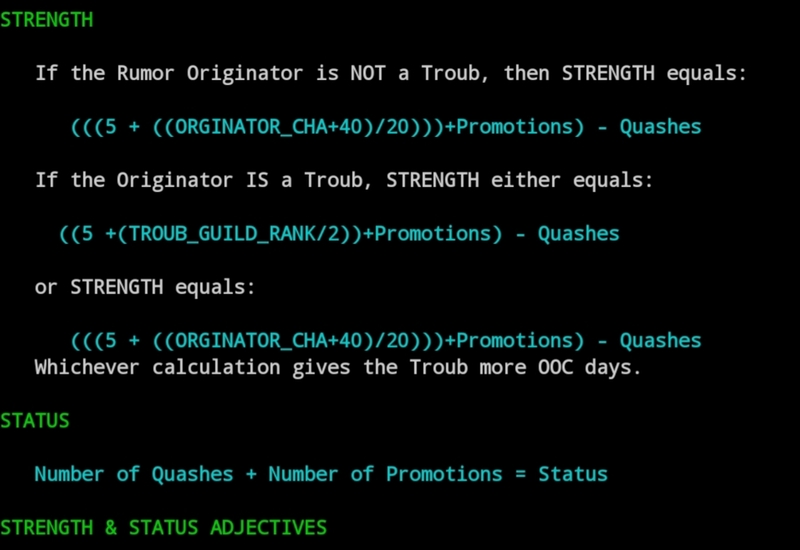 It occurs to me that roles may have altered the Troub calc since that used to be 1-20. I'll check with Az. That's interesting. So status is basicaly how many times people have either promoted or quashed the rumor, and if I guess correctly (the spec snip doesn't exactly explain it) strength is how long it'll stick around since the last promote/quash. I think one part of the confusion with the system for me is that the strength adjective doesn't seem to deteriorate with time. I'm almost led to believe a quash on an old, deep-rooted rumor will reset it and be counter productive, causing it to stick around longer. Yes, now that bardic rank is 0-6, if the code still expects 1-20 then we have been posting rumors with a big strength handicap for a while. If you could check it out and donate 50g to the Arts that'd be great.